Enduring Understanding #1 Educators must consider the world of work when considering curriculum and instructional models, tools and delivery, and assessments within a classroom culture that fosters 21st century skills..
Click the picture below for frameworks, videos, resources, reports, news...THE one stop to make! Check out the Nightline video clip to get a picture of a highly-successful, right-brained company at work. Wouldn't it be cool if at least some of our students' time could be spent like this at school? I love that teams have all different areas of expertise! Enduring Understanding #2 Comparing and contrasting the norms, perceptions, and behaviors of Net Geners (i.e. my students) and myself can help me make instructional decisions that will ultimately impact student achievement and future success. 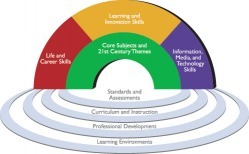 Enduring Understanding #3 ¨Educators must consider the world of work when considering curriculum and instructional models, tools and delivery, and assessments within a classroom culture that fosters 21st century skills." Enduring Understanding #4 Until real, systemic change occurs at every level of educational policy, teachers can plan and teach differently within their own classroom to achieve 21st century goals, motivate students, and stay sane!